World Wi-Fi is a decentralized network powered by blockchain technology. It is a global project which relies on the support of the community using privately owned routers (mainly residential) to offer free wifi to the public and earn tokens through internet advertising. Think of it as a Spotify for internet, you the user will connect to residential routers for free and in return you have to watch the odd advert here & there. Simple! So, how do users earn money? The aim is for advertisers to pay people providing the routers in World Wi-Fi’s native cryptocurrency, so for every person who connects & watches an advert they will receive a certain amount of tokens in return. In the end, everybody is a winner — the guest user no longer pays for access to the internet, the router owners generate revenue by sharing their resource, and advertisers reach their target audience. A nice way of earning passive income for the community. The Internet is important for a huge variety of reasons, and it affects and facilitates nearly every aspect of modern life. A view in society has evolved that Internet access is one of the civil rights of a person. The United Nations Human Rights Council adopted a resolution that condemns any state blocking or restricting access to the Internet for its citizens. At the same time, a greater part of the world population of over 7,6 billion people still have no access to the Internet. In most cases, those who have it must pay for it. The monthly cost of residential internet with a connection speed of 10 Mb/s in different countries varies from $3.40 to $197.70. An average monthly subscription fee in the world is about $30. If the Internet is considered to meet a basic human need, everyone should have an opportunity for Internet access whether it is paid or for free. According to the United Nations in 2016, there are over 800 million people below the poverty line (under $1.90 per capita a day). This is over 10% of the world population. The wealthiest and the middle class account for 24%. For 76% of the world population the monthly cost of the Internet is a substantial amount. Our mission is to make Wi-Fi internet free and accessible to everyone around the populated world. — Statement taken from the World Wi-Fi White Paper. These variables can be summed up into three groups: 1st — Token economics & Product. 2nd — Team and Advisors. 3rd — Social media and general publicity. World Wi-Fi receives 7/10 for token economics, there are several reasons for this and here’s why. 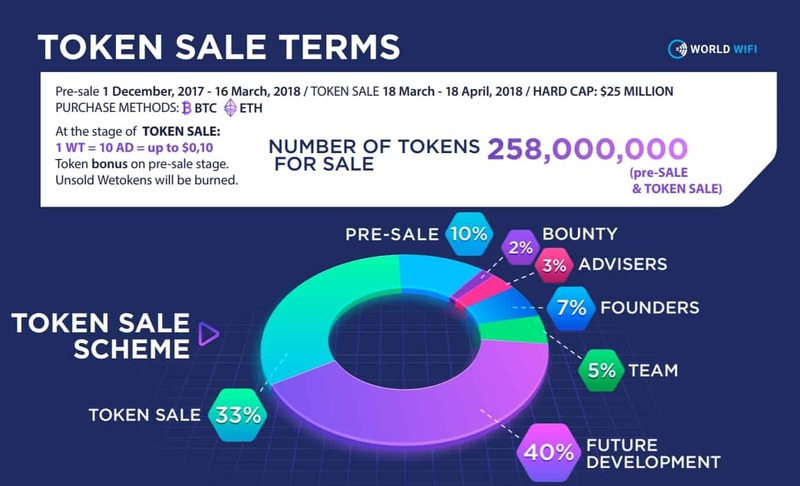 I feel that the 33% of fund set aside for the token sale is fairly low, especially with a hard cap of $25 million which again is quite high. It seems the days of ICO’s asking for 5–10 million are over and 20–30 million has become the new norm. Saying this they do have an uphill struggle ahead of them trying to change the way we connect to the internet and going up against the giant internet providers of this world, so the hard cap of $25 million seems fare when considering this. 40% is set aside for ‘future developement’, it would be nice to hear what they have specifically planned for this as it’s a huge amount just sitting in an account. I am sure that it’ll be used on marketing, legal and day to day costs. 12% is set aside for founders & team members which is reasonable and a further 10% on pre-sale which is positive for those looking to invest in the public sale. A slight concer is that Beta testing won’t be until after the token sale, so that’s something to consider too. World WiFi is lead by Ilya Yashin & Yan Sepiashvili. 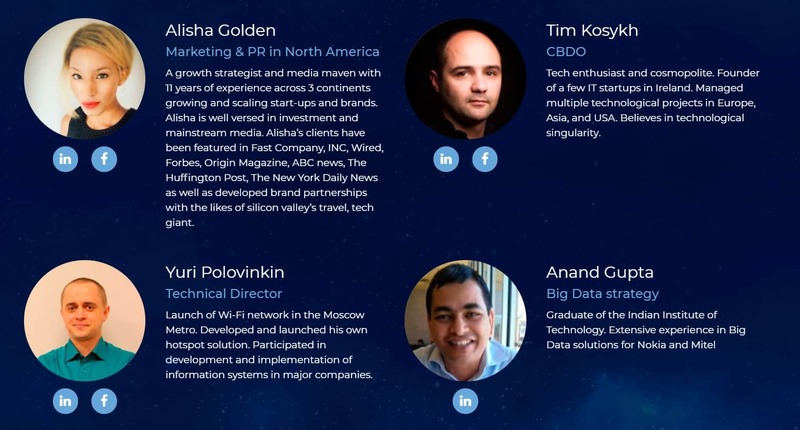 Both are Russian natives who have vast experience in Wi-Fi based companies which is a huge plus. They both co-founded AdRenta, which was the first aggregator of public Wi-Fi points for advertising sales. It uses a B2B platform for advertising in public Wi-Fi networks, this is the largest operator on the Russian advertising market in public Wi-Fi networks (37 cities, 14,000 sites). This proves that they can build a business from nothing into a huge global business and i’m sure they will use their ever expanding contacts at AdRenta to help boost World Wi-Fi. Yury Polovinkin is the Technical Director, he was in charge of the launch of Wi-Fi network in the Moscow Metro. He has experience in developing and launching his own hotspot solutions which is pretty impressive. He has also been a key player in the development and implementation of information systems in major companies. As a whole the team are very strong with a total of 12 members. Advisors – Dmitry Dain is one of the first developers of 802.11 Wi-Fi Protocol, he is a member of the world’s cryptographers’ association & a developer of Wi-Fi and LTE technologies. He is the owner and founder of ‘Virgil Security’ (USA), which is a company specializing in cryptography and encryption. Fred Ledbetter is CEO of Imaginet/Czech Telecom, CCO Virgin Connect, CMO Golden Telecom. As you can see just these 2 adviosrs out of the 7 on board hold huge amounts of knowlege in this industry which is fantastic news. I did notice that they have adviosrs specifically from the Korean Republic, Japan & China, so perhaps this is where they intend to focus World Wi-Fi first and as we know the Asia market is HUGE! The team score a healthy 8/10. Considering they are in pre-sale i would have liked them to have more of a media presence and following. With so many ICO’s at the moment and the fact that Facebook & Google have officially banned cryptocurrency advertising it’s getting harder and harder for ICO’s to be noticed. This ICO and the general concept behind it relies on a community of people getting behind it and believing in World Wi-Fi. I do think they are slowly getting there though as they have already reached their minimum cap of $3 million in the pre-sale alone, which does show that there is some backing and trust from the public. They have a rating of 4.2 on ICO Bench which will help them gain more traction as they move into the public sale too. I do think they could struggle reaching the $25 million hard cap based on the social media numbers alone, but, it’s still early days and if they don’t reach their hard cap it’s only a good thing for investors as the demand will be higher in the long run. Score: 6/10 for social media presence. The concept alone is great. I like the idea of getting free wifi when you aren’t at home. There have been so many times when i’ve needed to use the internet whilst away from home and companies like BT charge a fortune per hour in the UK, so i haven’t bothered. I wouldn’t mind watching an advert to access this service and as long as the speeds where high enough for general use, i’m happy. I believe advertisers are focusing more & more on targeted audiences and this is exactly what World Wi-Fi is aiming to do. For example, let’s say you live opposite a McDonalds, they as a company may want to use your router as it’s main hub for advertising to try and capture more foot fall into their stores in that area. This will be especially true if there are no billboards available in in highly populated areas. (This why i think Asia is the way forward for World Wi-Fi!). We are moving into an age where we spend more and more time on the internet so advertisers will continue to look for alternative ways to capture their specific audiences. Fromt he community side, World W-Fi presents a great way for people who perhaps don’t use thier internet as much to create a passive income. Most people spend 8–12 hours at work, so what if your router was earning you a steady income whilst at work? Even if it only covered the cost of having your Wifi, in my eyes it’s worth it. The team behind World Wi-Fi are super experienced and are backed by top advisors in this market, so if anyone can do it this team can. I will be eagerly following World Wi-Fi’s progress in the coming weeks and months.